In addition to their many other accomplishments, it’s hard to overstate the impact that Jon Stewart and Stephen Colbert have had on the evolution of the TV business over the past decade. As Stewart now follows Colbert from his late-night, Comedy Central post they leave a transformed industry in their wakes. Stewart and Colbert didn’t invent irony on television, or even in fake news — Chevy Chase’s Weekend Update segments on Saturday Night Live helped get that ball rolling 40 years ago — but their incisive, if mocking nightly meta-critique of how “truthiness” in news is manufactured, packaged and sold today left mainstream news organizations all looking self-consciously over their shoulders. At the same time, they helped create an entirely new paradigm for how a generation of viewers watched and understood the news. It’s hard to remember now, but Stewart took over anchoring duties at the Daily Show nearly 17 years ago — more than six years before YouTube was invented. Yet they seemed made for each other. The show’s easily chunkable format was ideal for the atomized milieu of YouTube, especially in the early days when YouTube uploads were tightly restricted by length, and the website quickly became the Daily Show’s second time slot — for better or worse. Even today, after an epic legal battle between Comedy Central’s parent company, Viacom, and YouTube, the online platform remains a critical outlet for the Daily Show. 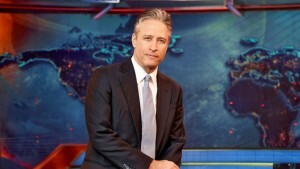 As Peter Kafka noted on Re/Code, the Daily Show draws about a million viewers in its initial airing. But millions more see it on YouTube the next day on their laptops and smartphones, or at least the bits their friends alert them to via Twitter, Facebook and other social media channels. Viacom’s nearly decade-long litigation against YouTube for copyright infringement, in fact, was in large measure about the Daily Show, along with the Colbert Report, South Park and a few other properties. It was the unchecked, unauthorized uploading of clips from the Daily Show and the Colbert Report, as much as anything else, that spurred Viacom to launch its $1 billion lawsuit against YouTube (and later Google ex-acquisition) in 2007. That lawsuit, which was finally settled last year, produced several landmark rulings in the case law behind the Digital Millennium Copyright Act, most of which went YouTube’s way. In particular, the courts held that online platforms like YouTube had to have knowledge of specific instances of infringement by their users, and then refuse to act on them, in order to be held liable for copyright infringement, rather than just general knowledge that infringement was taking place. Apart from the legal settlement, the lawsuit along the way became a vehicle through which the TV business and the internet implicitly negotiated new rules of engagement, by which each ultimately became indispensable to the other. The pressure of the Viacom lawsuit, along with similar cases brought by the record companies, helped prod YouTube into developing its ContentID system, by which rights owners can now monetize unlicensed uses of their content through advertising. Later, YouTube’s introduction of channels enabled rights owners to make their content available on the platform on their own terms. Today, online platforms like YouTube, Hulu, Netflix and Amazon Prime are as essential to the TV ecosystem as broadcast spectrum or cable lines. Those things would eventually have happened even without Jon Stewart and Stephen Colbert, of course. But the Daily Show With Jon Stewart was right on time for what was happening and played an outsize role in hastening it along. It will be a tough act to follow.